I started playing the Ukulele in 7th grade, Center School talent show was my first performance, while the older surfers at Marine Street—The Marine Street Crabs—were my inspiration. I rediscovered playing the Uke last year and found my original old Kumalae Uke from the 1920’s. I remember buying it at the Roadium Swap Meet in Torrance as a kid. I take a Uke with me on the road when I traveled for work and vacation. I love the way the Uke sounds, how it makes me feel, how small/light it is—it’s hard not to be happy playing a Uke. I’ve been working with a friend and teacher, Ron Caron, to develop my skills, add chords and create tabs for some of my favorite songs. The current playlist include some Johnny Cash: “Walk The Line,” “Folsom Prison Blues” and “Get Rhythm“. I’ve also rediscovered some of my favorite Beatles songs: “Til There Was You,” “She’s a Woman,” “Something” and “Only You” (this is a crazy video). McCartney played “Something” on the Uke at Coachella this year. George Harrison was a Uke player and I think a lot of what he wrote was composed on a Uke. I’m working on getting more Jack Johnson songs in the repertoire, and I dig playing “Breakdown,” which Jack plays on the Uke. If you need any of these tabs, or have any to share, hit me up. I’m always looking for good old Ukes, and like guitars, sometimes the beaters sound the best. My current favorite is a vintage Koa wood Kamaka from the 1960’s. I picked it up on ebay, cheap, as it isn’t the prettiest example. But the tone is magical. I also recently scored a vintage Martin on ebay, that while there’s a lot of crazing of the varnish, the sound is warm and beautiful. When the varnish is perfect, they sound tight and tinny and lack the charm and tone of the crazed ones. There’s been a lot of Ukulele press lately including a really interesting NPR piece on the Uke’s revival as sales are climbing while musical instrument sales in general are on a steep decline. The story centers on a group of displaced UAW workers in Michigan who regularly get together to jam on the Uke. Speaking of that, I brought my Kamaka to work in Palo Alto last week, and played at lunch with my colleague , fellow surfer and bro Teddy Underwood. Teddy’s a great Uke, guitar and banjo player. It was a treat. I can’t go a couple days without picking up the Uke, I always take it to the beach with me—some of my Sunday volleyball buddies are getting sick of it. 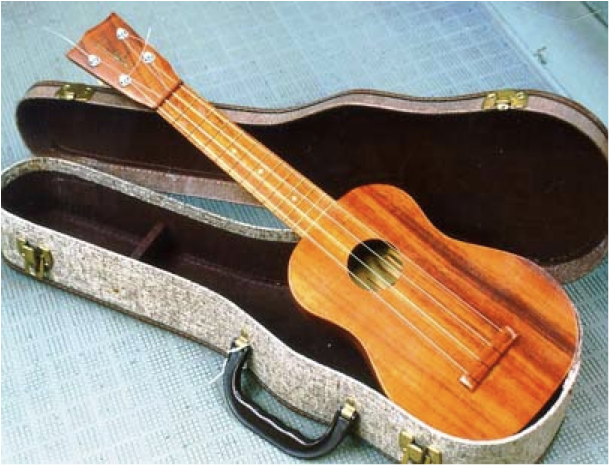 And, with some upcoming trips, I know the tweed Uke case is gonna be in the overhead bin. I am now inspired to learn how to play the Uke. Thanks Matt for your fantastic story of rediscovery and carrying the Aloha with you on your many trips. I liked this post for lots of reasons – I’m sorry I missed you playing your uke at work. Let me know next time! Next time you’re on Oahu, check out Koaloha, my buddy’s brand.